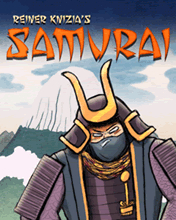 Part of the Reiner Knizia tile-laying trilogy, this game is ostensibly set in medieval Japan. Players use hexagonal tiles to surround cities, which have one to three different figures: rice paddies, buddhas, or high hats. The tiles represent influence on particular facets of the cities, and the highest influence on a figure when the city is surrounded takes that figure. The object of the game is to have more of any one else in one category, and then have the most remaining figures.